[embed]https://www.youtube.com/watch?v=fmsYYGyQS0g&t=2s[/embed]Why buy the book? 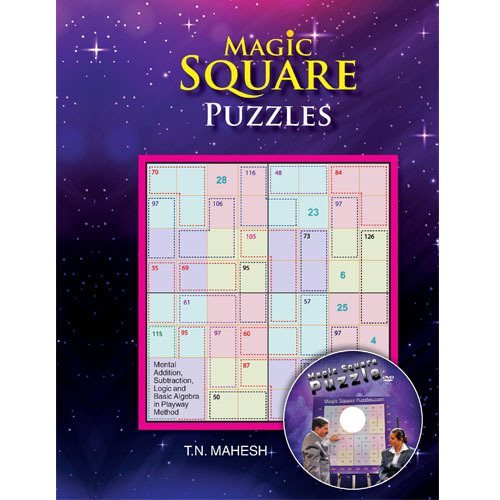 The Magic Square Puzzles are play way method to do addition and subtraction. Anyone, including students who solve this puzzle will become proficient in addition and subtraction in their mind itself even after solving a few puzzles. If after placing order anyone cancels it we will refund the money less the handling and postage charges. After buying the book if anyone returns the book – the refund is subject to the discretion of the publisher. Even in case of refund the amount paid less than the handling and postage charges will be deducted. All the information that you provide to us will be kept confidential. No information of yours like your e-mail, mobile number, address etc. of yours will be sold or given to anybody or any organization.